Pirates of the Caribbean 4 makes an unsurprising start, with Jack Sparrow (Johnny Depp) trying to save his old shipmate Gibbs from getting hanged but ending up captured. 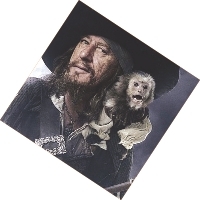 He is brought before the King of England, and the King orders him to lead his fleet to the Fountain of Youth before the Spanish, but he must work under Captain Barbossa, his archenemy. 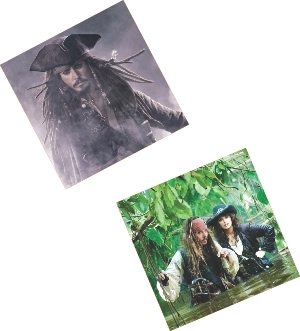 Jack Sparrow escapes spectacularly, using his acute moves, a pastry, and help from his father, who tells him of rumours circulating that he is recruiting men to set sail. Jack Sparrow already knows of these rumours and has come to London to investigate these. It turns out to be the work of an impostor, who Jack Sparrow is curious to meet. Amongst drunkards in a tavern, Jack Sparrow comes face to face with his impostor after a showy face-off. Surprisingly, it is a woman, played by Penelope Cruz, who he once had a love affair with in the past. She is also the daughter of Blackbeard, a pirate feared by all for his magical powers. She forces him onboard Blackbeard's ship, Queen Anne's Revenge, and Jack Sparrow sets off for another adventure, this time with mermaids and the Spaniards. The fourth movie in the Pirates of the Caribbean series proves to be somehow more humane, with Jack Sparrow's former fling onboard, but it becomes quite apparent that the Pirates of the Caribbean movies will not be the same again without Elizabeth Swann and Will Turner. This movie lacks the dynamic, sword swinging scenes from the first movies, and also contains fewer laughs. One would expect the notorious Blackbeard to be more intimidating, and the fact that he is not is a bit of a bummer. At one point, the plot becomes too twisted and difficult to keep track of, and the movie can get a bit boring as well. It lacks the spirit of the first movies, and Johnny Depp even seems a bit tired of his role! Despite these, watching Johnny Depp and Penelope Cruz on screen with their fantastic acting skills is a treat, and as the movie starts, one gets the feeling of returning to the sea like an old sailor after a long time on land. This movie is ideal for those who do not want to bother with following lengthy storylines from the previous movies. The one scene that everyone should watch out for is the blood curdling mermaid war which certainly gives this movie a sharp edge. Movies are great and everything, but you don't always have the full two point five hours or the focus to sit in front of the screen and actually follow a storyline. That's why we have TV shows. 2009-10 sucked royally on that front, with new seasons of ongoing series being unsatisfactory. There were a few new shows with promise, but overall it was a disappointing TV year. But it looks like 2010-11 came in with a vengeance. Most of the new seasons out this year blew their fans away. House (Season 7) Although not exactly explosive, House doesn't lose steam even after six seasons. Hugh Laurie won another award this year (and was nominated for several more), and Jennifer Morrison officially left the show. You'd think they would run out of ideas for freak cases and unique characters by now, or the House and Cuddy relationship drama would get boring, or House would grow some sanity, or Chase would grow less hot, but nope. House is still brilliance. Dexter (Season 5) After three crippling seasons, the fifth one picked up the pieces. Still nothing in comparison to the first, but certainly improved from Seasons 2, 3 and 4. Season 5 wasn't one of the best, but viewer ratings are through the roof on this one, so here it is. Castle (Season 3) The second season was just bad, despite the ratings. To be able come back from that the way Castle did deserves applause. The cases are comparatively better, Beckett realised how terrible her hair looked last season and changed it; there's some great eye candy for the men, Castle is still ruggedly handsome, and ladies, keep an eye out for the dead stripper episode. Castle won People's Choice for best season finale. This one was explosive. Gossip Girl (Season 4) Yes, it's basically The O.C. in New York, with great fashion and Chuck Bass. It does, however, boast phenomenal soundtracks and exquisite storytelling. Unlike most other drama serials, Gossip Girl gets better with each season, instead of struggling to live up to the first and failing. This time there's a trip to Paris, references to Princess and the Pauper and the Royal Wedding; there's college, jobs, scandals, and general Chair melodrama that keeps viewers swooning even after three seasons. The Vampire Diaries (Season 2) Picking up immediately from last season, Vampire Diaries seems to have made it a mission to make people forget about Twilight and bring vampires back to glory. This season puts bigger spotlights on the werewolves, and of course there's plenty of angst to go around. What's impressive about Vampire Diaries is how it doesn't go overboard, despite the intense plot revolving around mythological creatures of the dark. The Big Bang Theory (Season 4) Okay. It's the Big Bang Theory, guys. It doesn't need description. Worth mentioning, though, is how it just keeps ruling the Emmy's. Modern Family (Season 2) - This year was for the comedies. Modern Family's first season came on right after an excellent season of How I Met Your Mother, hence alienating too many viewers. The second season is definitely funnier, and it picked up too many nominations to avoid mention. Community (Season 2) It's only season two, and Community rocketed off the charts. Abed is (if possible) even more awesome this time round, and people, there's another game of paintball. Glee (Season 2) Opinions from the other side of the world aside, yours truly has yet to see a first season as bad as Glee's. However, Season 2 is, admittedly, really, really good. The song selections are much better, the cast has matured and hence the singing is exceptionally good, and the plot is more diverse. The life-lessons are a tad bit annoying, but Glee is picking up nominations and awards left and right, and despite everything, this season deserves it. "WEIRD AL” Yankovic seems to have been around for an eternity. His first album came out all the way back in 1983 and he's been churning out records ever since. His 13th album, the sinisterly named “Apocalypse”, is his first album in five years since the brilliant “Straight Outta Lynwood” which successfully introduced him to a newer generation of listeners in the 2000s. To long time fans of Weird Al, this album will be a bit of a disappointment. It plays like a dance album although I suppose that can't be blamed on him, looking at the current state of the music industry where anything catchy is being termed as “good”. There are songs that parody other genres such as “Craigslist” which is a style parody of “The Doors” and “CNR” to poke fun at the garage rock sounds of “The White Stripes” with lyrics of feats only possible of Chuck Norris. No seriously, the song is about Chuck Norris-like superhuman feats. But back to the point, while there are some songs to throwback to an era when music was more than a synthetic, superficial dance tune, the pop covers are more dominant throughout the album. Then there is the parody of Miley Cyrus' party anthem “Party in the USA” which becomes the happy theme song of assassinating dictators and bringing down third world regimes while remaining oh-so-awesome in black shades in “Party in the CIA”. But the standout point of the album is probably his parody of Taylor Swift's “You Belong With Me” titled “TMZ” and a straight up hilarious attack on the relentless paparazzi. Absolutely ingenious. “The bad hair-day and a sweat stained T-shirt, that's the story they're gonna feature, with exclusive pics of your flabby behind”. The album ends with the slow “Stop Forwarding This Crap to me”, a style parody of “Meat Loaf” about the annoying waves of junk mail that people get because people don't want to take a chance when chain letters show up in their email inbox. A lot of us can relate to this song. The low point though is probably the fast paced polka medley that has become almost customary in Weird Al's albums, “Polka Face” featuring a glut of pop songs including but not limited to “I Kissed A Girl” by Katy Perry, “Womanizer” by Britney Spears and “Poker Face” by Lady Gaga. It turns out it's a good thing that the song is so fast paced because it's over quick and the punishment is not prolonged. More so than the parodies themselves the appeal of this album could be the admiration Weird Al inspires due to his almost heroic stance to not give up and retire. It's not a bad album, but it's not as good as classic Al in “Off The Deep End” or “Dare to be Stupid”. It's a reflection of the state of music today. But it's good for more than a few laughs. As Homer Simpson once stated “When you're tired of Weird Al, you're tired of life itself”.